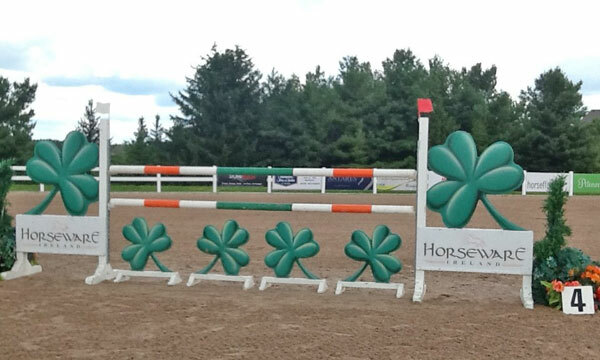 We are back at Caledon Horse Park for week five, and will be the first of three weeks of showing. The circuit has come back from Ottawa where they had two weeks of very successful competition. 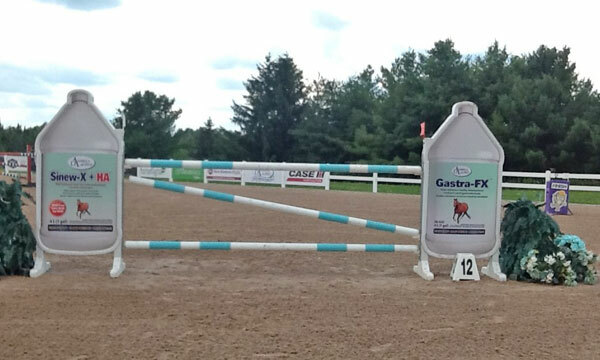 The FEI rules were in effect at Wesley Clover Park and several American barns were there for the possible rider points. 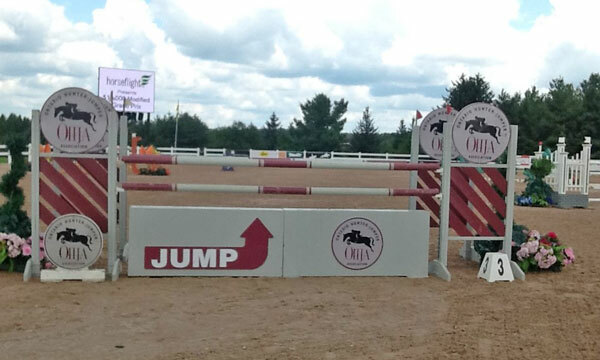 All comments were very positive and the venue has secured a vital stopping point for jumper barns in our summer circuit. 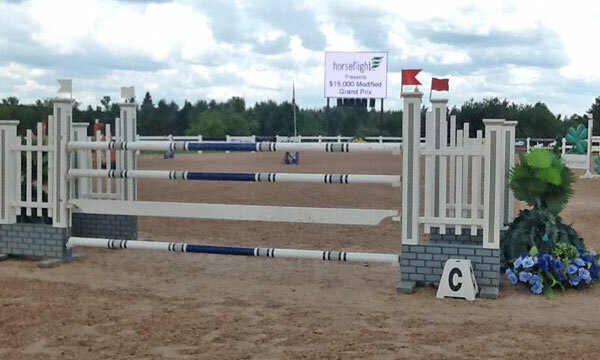 Their main grand prix ring is a grass surface (that has had major repairs) which gives the riders on any circuit a change from the artificial surfaces encountered almost everywhere (except Spruce Meadows and Thunderbird). 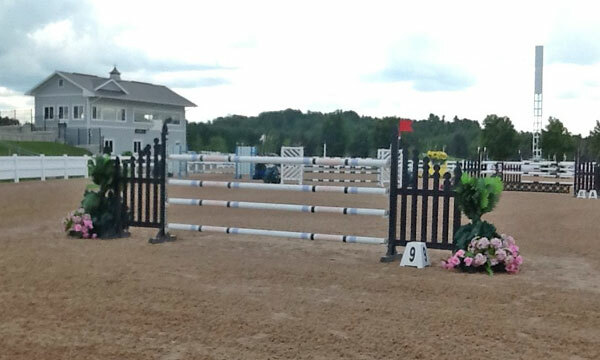 The summer season of shows in Ontario involves almost a show a week without a break and entries can be eratic which was the case this week at Palgrave 5. The hunter divisions were full, as usual, as many hunter barns from around Toronto did not go to Ottawa. 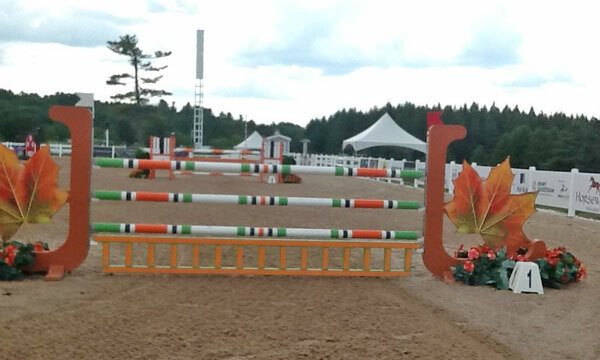 The jumper divisions, however, were down on entries, as they chose to rest a week of national rules and come back for the next two that will feature FEI rules. 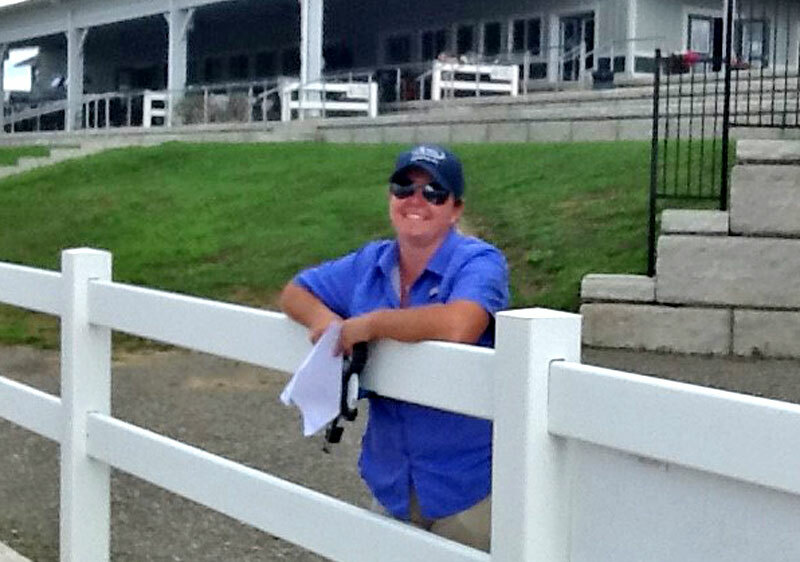 Our course designer has been Jennifer Ferguson and she was featured a few weeks ago. 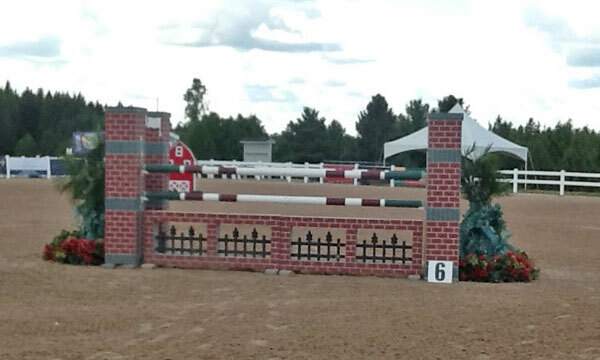 The previous designs were in the jumper annex and this week the grand prix will be back in the grand prix ring. 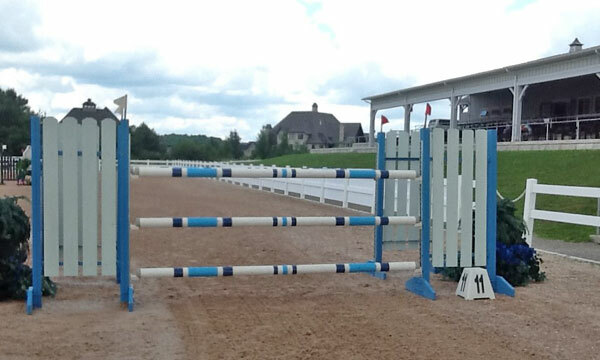 The smaller ring will give the course designer a specific set of tests that come with the smaller ring and the larger ring will have some different tests that go with the larger ring. The number of entries will be 13 and all will compete. The prize money is $15,000. The class is run under national rules. When using national rules the course designer has more freedom to build the course based on the field rather than being held to a specific standard. There is a standard on national rules, but they are more liberal than the FEI. The class description indicates the height to be 1.35/1.40m and the speed to be 350m/m. My favourite expression for course design is “it is easy to be hard, but it is hard to be easy.” The job of the course designer today is to find that fine line of tests that will give the riders a fair course and the spectators a competitive jump-off. Before the walk I will say that I think a good result today will be to see about 50% of the starting field make it to the jump off. It is now time to start the walk of the $15,000 Horseflight Grand Prix. #1 vertical 1.30m or 4.2ft and remained intact on the day. #2 oxer 1.30/1.35/1.35m or 4.2/4.5/4.5ft and comes from #1 in a straight line with a distance of 26.2m or 85.9ft. This oxer ended the day very quickly for one rider. 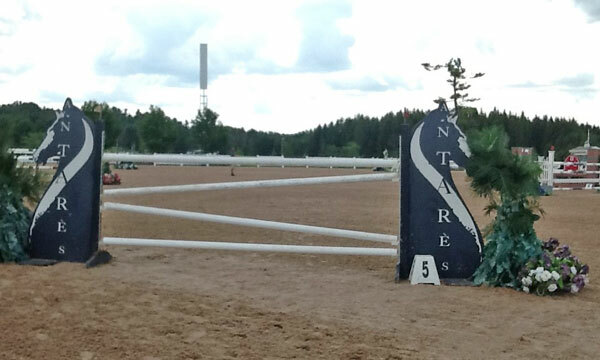 #3 oxer 1.35/1.40m or 4.5/4.6ft comes from #2 on the left turn away from the in-gate and was never faulted on the day. 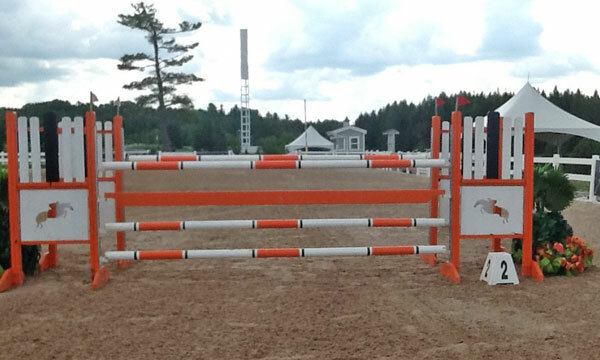 #4 vertical 1.40m or 4.6ft comes from #3 on the right bend with no given distance and tumbled to the floor one time. 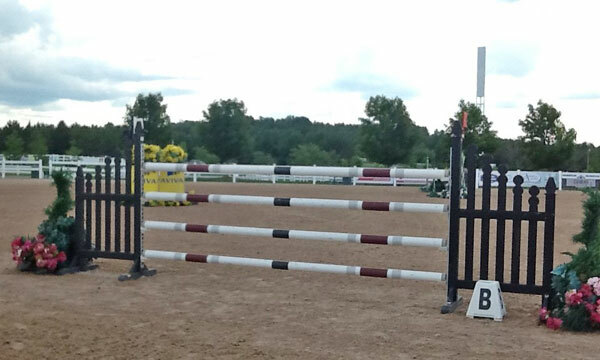 #5 vertical 1.40m or 4.6ft comes from #4 on the right rein and was not damaged during the class. 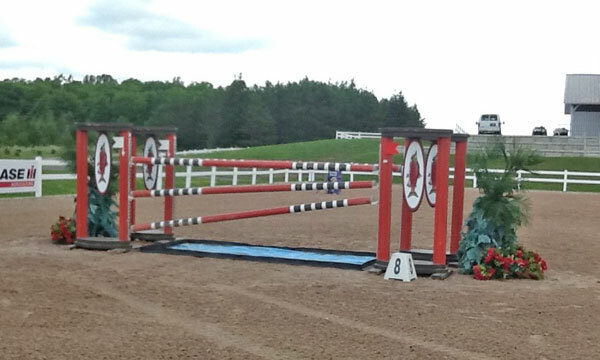 #6 oxer 1.35/1.40m or 4.5/4.6ft comes from #5 on the right bend with no given distance and did not get sandy today. #7a vertical 1.35m or 4.5ft comes on the left turn from #6 and remained in the cups all day long. #7b vertical 1.40m or 4.6ft comes from #7a with a distance of 11.20m or 36.6ft and did not pose a problem for any of the riders. #7c oxer 1.35/1.40m or 4.5/4.6ft comes from #7b with a distance of 8m or 26.3ft and the back pole was slapped out of the back cups one time. 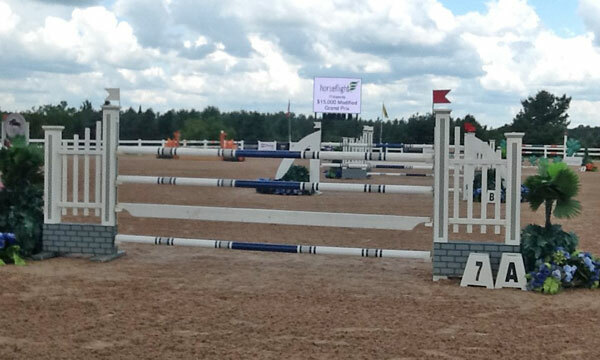 #8 oxer Liverpool 1.40/1.50m or 4.6/5ft was the largest fence on the course and splashed down one time. The Liverpool came from #7c on the right ten and had no given distance. #9 vertical 1.40m or 4.6ft comes from #8 on the right turn with no given distance and was not faulted on the day. #10a oxer 1.35/1.40m or 4.5/4.6ft comes from #9 in a straight line with a distance of 22.5m or 73.9ft and received a clean bill of health today. #10b vertical 1.40m or 4.6ft comes from #10a with distance of 7.90m or 25.9ft and fell from grace two times. 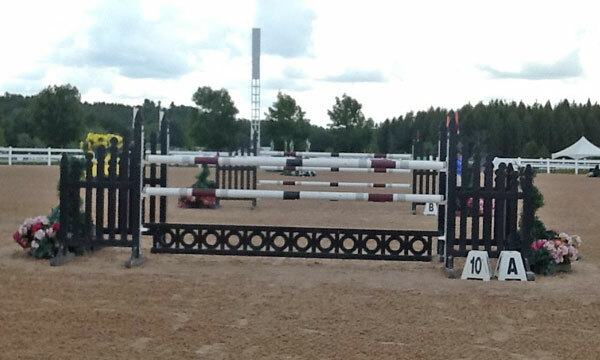 #11 oxer (10ft poles)1.35/1.40m or 4.5/4.6ft comes from #10b on the left turn and also found the floor two times. #12 vertical 1.40m or 4.6ft comes from#11 on the left bend and no given distance and was not faulted on the day. This was the last fence on the course today. The final results of the first round will give us seven clean, three with four faults, one with five, one with eight faults and one with 10. The TA was set at 89seconds and reduced to 83. The speed was 350m/m and once again I will say that 350m/m has no place in these classes. The sport has evolved beyond this speed. The normal speed should be raised to 375m/m and this will reduce the number of TA’s reduced after the first three rides. 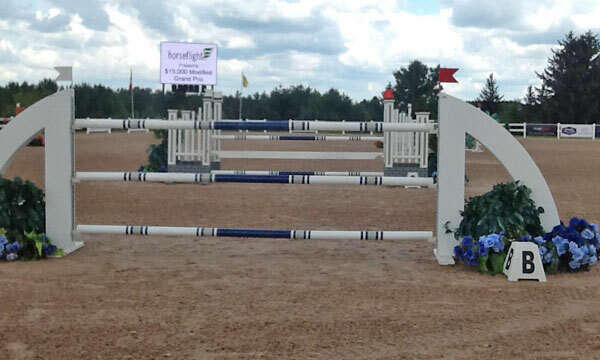 The course today had really good results and it was not an easy build for the course designer. The course did not involve any real technical aspects and the spreads were really soft. The triple combination was a standalone test and rode easy. The only significant use of material was the Liverpool oxer and did not pose a problem. These were all due to careful thoughts by the CD to create the final results and to be easy is hard. Jenn has shown a good ability to use a smaller ring and get great results and also to get the same results in a larger ring. Good work Jenn. Next week is the first of two with the FEI ranking and Guillerme Jorge (BRA) will be the CD. I will not walk the grand prix, as I will be assisting Beth Underhill in Old Salem, NY, at the North American Young Riders/JR/ Children’s Championships but will be back to walk the grand prix in week three.